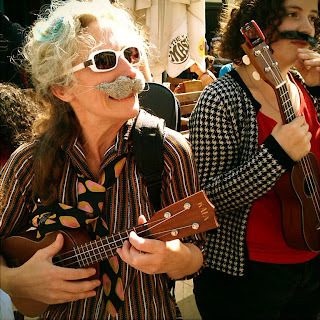 On a balmy September afternoon Wukulele trooped over to Brighton to pay a ukulele tribute to the hirsute individuals taking part in the British Beard and Moustache Championships. It was a flashmob happening but in our own idiosyncratically understated style. No rehearsals, no secret rules, no complicated instructions or mystery to the proceedings, just a call to all comers to turn up, strum and sing in appreciation of this fine event. 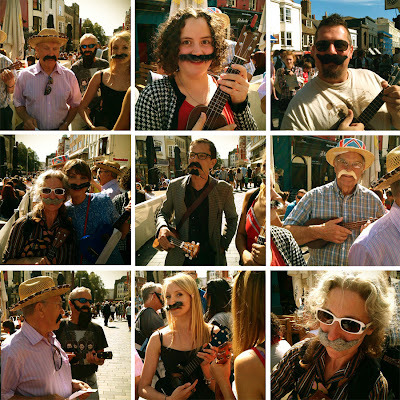 Those of us not endowed with sufficient facial plumage wore home made or hand drawn moustaches and beards. We played The Kinks 1966 hit single Dedicated Follower of Fashion twice through to a cheering and mostly moustachioed crowd.